In 2014 Michael’s searing collection of essays about the United States; A Thousand Shards of Glass: There is Another America, was published by Simon and Schuster UK. “George Bernard Shaw observed that all progress depends on unreasonable men-as reasonable men adapt themselves to the world and do not try to change it. 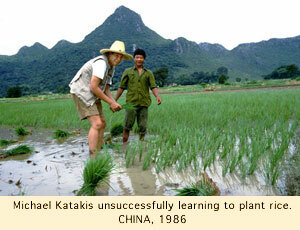 But Michael Katakis is a reasonable man who has refused to adapt. A Thousand Shards of Glass, a book written with remarkable prescience some years ago, recounts with sad eloquence his disillusionment with America. His is a voice full of common sense and simple humanity that seem to have been lost in contemporary America. It is a voice both kind and angry, the voice of a reasonable man who has not lost his idealism but who is deeply troubled by what he sees and describes so clearly."